Corrupt Lobbyists are constantly attempting to scare, legislate and dictate how citizens live their own lives. 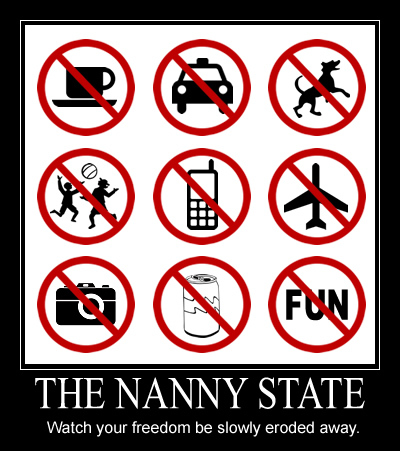 Lets strike back against Nanny State control freaks by exposing their dictatorial agenda. “Excuse me, are you a robot in the Surveillance State? You need to be a member of Nanny State Politics Exposed to add comments! I''m not so computer savoy but I was thinking about all the crazy things going on with these schools, businesses, and police, it it possible to create a complaint site that is similar to "RIPOFF.com or Complaint.com. You can file a complaint about scammers, bad business practices or anything like that and the complaint is posted on the internet while an e-mail is generated to the violators to come forward and defend themselves. Of course they don't have to but then if they don't it could go against them and they lose customers. Perhaps a similar site could be made categorized by state, schools, police departments , politicians, etc in much the same way and so when November comes around or public promotion time comes then people can be reminded of their dirty deeds and it could weigh in on them. They will have to remember they they are accountable for their actions and the "ALL SEEING EYE" of the public is watching them too. People can say how they felt about their actions like the people in the below articles posted by Lawrence Edward Calcutt. 'Shops and offices throughout France will be forced to turn off their lights overnight in a bid to fight light pollution, the country's environment ministry has announced. The fight for parents’ rights and healthy food in public schools has just been ratcheted up a notch. It made national news earlier this year when a North Carolina preschool student’s homemade lunch was confiscated by school officials for not meeting USDA standards, and the four-year-old was forced to trade her turkey and cheese sandwich and banana for the school’s pink-slime-filled chicken nuggets. The nanny state was thrown into overdrive last week when an elementary student in one California school district was interrogated by police all day and subsequently suspended for five days for the dastardly crime of bringing a kombucha tea in his school lunch. The school also reportedly told the child he may have to sign up for a youth alcoholics program. All of this was apparently done without a parent or guardian present. New York City's health board has passed a rule banning super-sized, sugary drinks at restaurants, concession stands and other eateries. We are the Majority! They a Minority! It's time we told them all "Where the Bear Shits!"